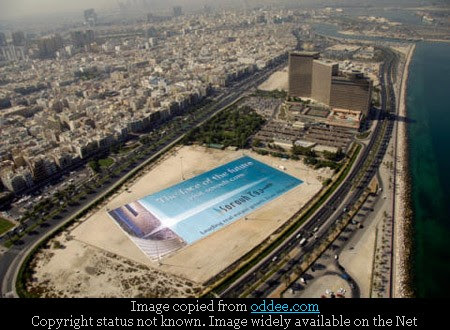 World's largest poster with gigantic dimensions of 200x100 metres was displayed near Hyatt Regency, Dubai on Oct. 22, 2007 by Sorouh Real Estate P.J.S.C. For creating the poster the ground was levelled using several hundred tonnes of concrete. A special canvas of 20,000 Sq. metres was used to create the poster and another canvas of same size was used to cover it till its official opening. The poster was placed directly on the flight path to the Dubai International Airport and meant as an initiative to collect one million faces to be placed on the poster. For every photo gathered, Sorouh was to donate $1 to the UAE Red Crescent, totalling a donation of $1m.